Miniature Vase in Antiqued Bisque - 215 Discounts Apply ! This miniature vase in antiqued (ecru) bisque has raised cherubs and floral garlands. 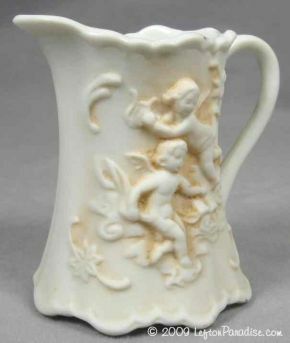 It is a miniature of a Lefton creamer in the same design. The piece is 2¼ inches tall and is marked 215. There are no flaws on this piece.